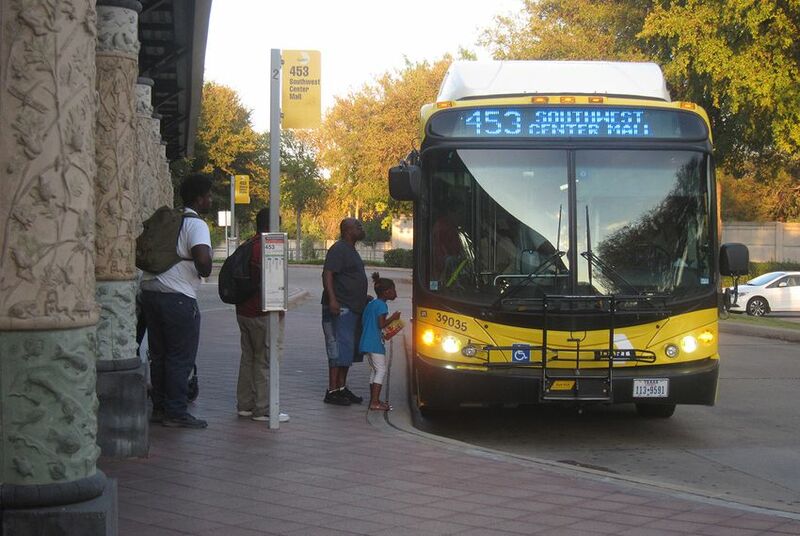 In rare move, the Dallas City Council replaced half of its appointees to one of the state's largest transit boards as city officials push for more investment in improving bus service over building out its regional rail network. Dallas Area Rapid Transit passengers board a bus at the Hampton Station in October 2016. DALLAS — Amid an increasingly tense regional debate over how transportation dollars should be spent, the Dallas City Council on Wednesday replaced four of its appointees to North Texas’ largest transit agency, sweeping out board members criticized for rubber stamping staff proposals that favor the region at the expense of its urban core and for not being strong enough advocates for improved bus service. It was a rare move for the city, which appoints seven of Dallas Area Rapid Transit’s 15 members and shares another appointee with the city of Cockrell Hill. The new appointments come as the agency faces pressure to build a new suburban commuter rail line, connect two streetcar lines, construct a downtown Dallas subway and improve bus service in 13 cities. Those are all costly projects for a government agency with limited financial resources. “We've got a lot of big decisions to make,” DART board member Sue Bauman said at an agency meeting this week. The shakeup could usher in a culture change for one of the state’s largest transit agencies after its leaders have spent years wrestling with how to fund and design viable transit in a sprawling, car-centric urban region growing far beyond DART’s borders. Dallas council members in recent months have criticized some of the appointees ousted Wednesday. “What I saw was Dallas board members who just sat there, meeting after meeting, rarely ever asking a question or making a comment or offering a thought,” Dallas City Council member Sandy Greyson said last month. But DART chair Faye Moses Wilkins, who represents Plano and Farmers Branch, suggested this month that she would start saying “enough is enough” to her colleagues’ questions about being able to afford major projects. “I find that we’re challenging staff a little more than normal for these situations,” she said. Dallas officials have been adamant for months that they want the agency to improve the frequency and dependability of a bus network widely criticized for being inefficient and unnecessarily burdensome on transit-dependent North Texans. But the board in the past year has focused more on building the two rail projects – the Cotton Belt line in the northern suburbs and a second downtown Dallas light-rail route that has been dubbed D2. The City Council’s vote effectively ousted longtime DART board members Jerry Christian, Pamela Dunlop Gates and William Velasco. They removed Richard Carrizales from his seat last month. Those four members will be replaced by Catherine Cuellar, Ray Jackson, Jon-Bertrell Killen and Dominique Torres. Dallas representatives Patrick Kennedy, Michele Wong Krause and Amanda Moreno were reappointed to new terms Wednesday. The City Council’s vote Wednesday came the week after tempers flared during an uncharacteristically contentious DART meeting. It was the second time this month that DART board members had heatedly debated plans to take on nearly $1 billion in debt for the Cotton Belt line. The vote on appointees also followed the Dallas City Council’s decision in May to remove Carrizales, the DART board's former vice chair. Suburban DART board member Tim Hayden last week said that move was an attempt to kill the Cotton Belt project. And suburban appointee Mark Enoch this month said Dallas officials are trying to make D2 a priority over Cotton Belt in case the board can only build one over the other. “That is how we feel, and you all need to deal with it,” he said. Taking on debt for the Cotton Belt, which would link several suburbs and Far North Dallas to Dallas/Fort Worth International Airport, requires support from 10 of 15 DART board members. After Carrizales was ousted, only nine members supported the project in two failed attempts to approve the debt. Some Dallas appointees to the DART board denied that they were trying to kill the Cotton Belt line. They said they don’t want to approve the debt until they have contingency plans in place for affording bus service improvements and construction of the Cotton Belt and D2 in case a federal grant program planned for the downtown rail line is scrapped. The agency can only take on so much debt and so far plans to delay some bus improvements so Cotton Belt and D2 can move forward. Two Dallas appointees ousted Wednesday – Christian and Gates – voted in favor of issuing the Cotton Belt debt. Gates and some suburban DART board members fear that if the line isn’t built, some DART member cities will pursue an election to officially pull out of the agency. Addison officials have said for years that they will seek such an election if the line isn’t built. That city has waited more than 30 years for rail service on the Cotton Belt line. If it or other members withdraw from the agency, DART will lose millions in sales tax revenue each year. “My concern is we are pitting each other against each other,” DART board member and Irving Mayor Rick Stopfer said. Plano DART appointee Paul Wageman voted in favor of the Cotton Belt project this month but questioned Wilkins’ decision to twice put it before the board ahead of Dallas’ vote on its appointees – and without a budget committee considering its financial implications. He said his colleagues’ handling of the matter was so “inappropriate” that it made him uneasy about voting in favor of the project even though he wants to see it built. “I don’t find it transparent,” he said last week. The accusations that Dallas appointees wouldn’t vote for the Cotton Belt this month also came as DART’s chief financial officer said the agency has several months to approve the project’s debt. That prompted Dallas appointees to accuse their colleagues of twice trying to push the Cotton Belt through ahead of Dallas’ new board members being appointed. Wilkins, the board chair, said the board last week appeared “disjointed.” She and Stopfer said at a DART meeting Tuesday that if the agency is going to seek federal funds for major expansions, board members need to present a united front.